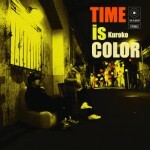 "TIME IS COLOR" (黒衣, BESHALIST, atius, JAB) ＜TRACK LIST＞ 01. intro 02. 風向き 03. Copyright© Radio708 , 2009 All Rights Reserved.